A supreme composure born of strength of character. An indomitable spirit, yet serene self-possession. It is timelessly elegant, compellingly simple - a classic. It is precision technology married to contemporary clarity, for the peace of mind to bring ideas to light. 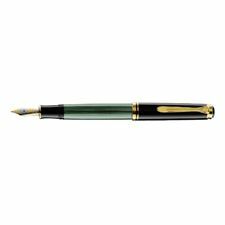 These super-size representative plunger fountain pens are the most exclusive and largest writing instruments of the Souveran range. 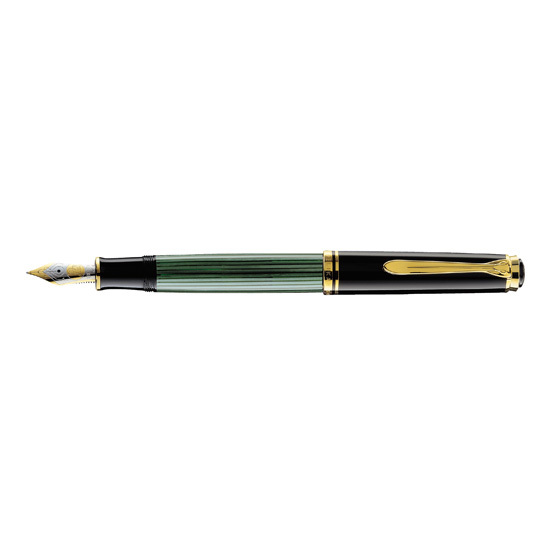 This Souveran 1000 fountain pen features a black and green colour sleeve, diamond-ground surface and solid brass components in the mechanism. The Pelikan clip and all fittings are gold-plated. There are gold-plated double rings at the ink-handle and a decent gold-plated decorative ring in the front section. A large, hand-crafted, finely engraved 18 carat gold nib with rhodium decoration is available in extra fine, fine, medium or broad nib sizes. A meticulously crafted presentation of every writing instrument is together with an ink bottle in a high-class silk-lined card box.